I had a great time at the four-day basket weaving convention on the east coast of Virginia. 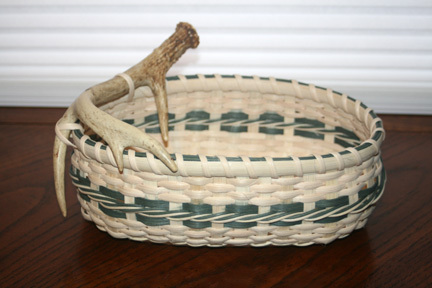 Thursday night, I made “Ann’s Oval Antler” basket, taught by Gina Keift from Michigan; Friday’s class was “Scrap Basket” taught by Peggy McCarson from South Carolina. 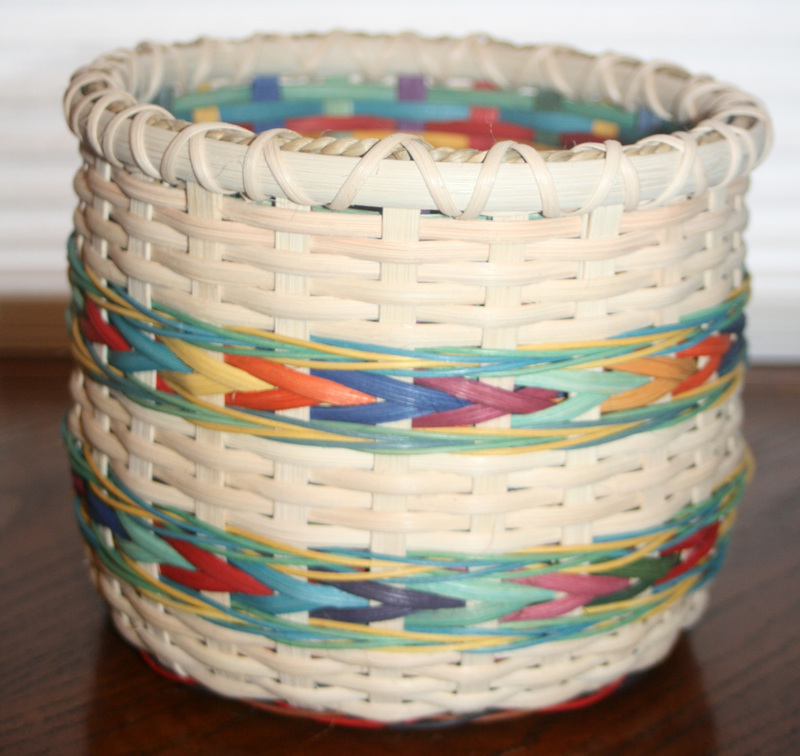 It is a double wall basket. Basically, it’s two separate baskets joined together at the top. 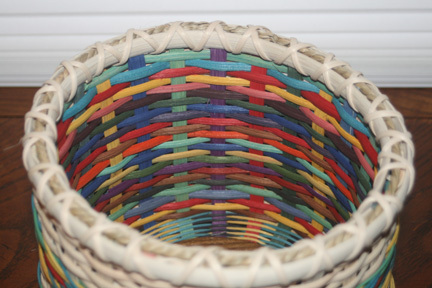 Saturday’s class “Teal Beaded Treasure” was taught by Sharon Klusmann of Ohio and Sunday’s class “Tapestry Weave Basket”, taught by Anne Bowers of West Virginia, was a combo of weaving with reed and yarns—a fiber arts project that represents a landscape. My basket has mountains, a waterfall and sun. 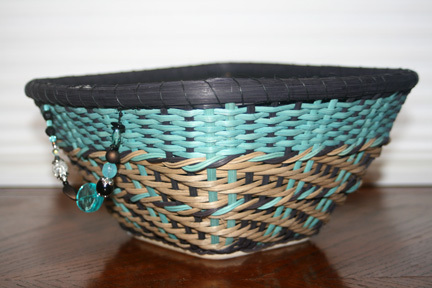 I completed three baskets but “Teal Beaded Treasure” is still in progress. I met my friend, from Maryland, and we stayed at a B&B. It was her first time at a B&B and I think she really enjoyed it. She quilted during the day while I went to my classes. It was really nice catching up with her. My husband and I have stayed at B&B’s for many years and it’s a lot of fun. If you happen to drink Stash Tea, they have an offer where you can mail in three UPC’s (cut off of the Stash Tea boxes), go to their web site and click on B&B Offer. Fill out the form and send in the three UPC’s along with a check for $3.95. They will send you a certificate for “buy-a-night-get-a-night-free” and a catalogue with participating B&B’s. Some B&B’s have black-out dates during their busy season, so be sure to verify in advance. (Last ingredient to add) Approximately 5 or 6 cups chicken broth (to taste or however much your crock pot will hold). Cook all day in large crock pot on high. To serve, sprinkle each bowl with mozzarella cheese and enjoy with tortilla chips (on the side or crushed and sprinkle in the bowl). BTW, left over’s freeze well. Welcome to my first blog post! For as long as I can remember, I’ve been designing and coordinating fabrics. On my history page (http://www.cameliaelliott.com/History.html) you may read all about how I got my start. That’s how I feel. I enjoy many things and have numerous hobbies. When we moved from Texas to Virginia, one of our friends, who helped out commented, “I see that Camelia is one of those hobby girls….” Things I have tried and spent time working on include (but are not limited to): sewing, quilting, hand embroidery, English hand-smocking, counterchange smocking, French hand sewing, duplicate stitch, cross stitch, blacksmithing, upholstery, polymer clay, doll making, basket weaving, chair caning, rug hooking, woodworking, writing, photography, canning (400+ jars per year) as well as something my husband refers to as “Camelia’s chair rescue”. My good friend in Texas says there is an official name and several terms for furniture rescue: shabby chic, prairie antique or prairie décor. That being said, on my blog, I’ll talk about quilting and my numerous other projects. Today, I’ll talk about my coolest project this year—a quilted couch! Here’s how it all came about. We were in the market for new living room furniture and I hated the thought of giving up my comfortable couch with a cozy hide-a-bed that we use when we have a house full of company. After all, they don’t make things like they used to and the sofa has a good, sturdy frame. I called Francine’s Upholstery to get a quote on reupholstering my couch. She mentioned her classes at the Jacksonville Center for the Arts in Floyd, Virginia and I decided to take a class. We were visiting about the project and I expressed my interest in using two fabrics. At that point, I had the bright idea that I could have a quilted couch! The end result was stunning. Quilt shop owners from miles around went crazy over my first quilted cushion. I decided to share my concept with others. When I went to my machine quilter’s house to pick up the quilt, she commented, “This looks really good on my bed.” She was right. I made the decision to add instructions for a bed quilt to the book. This pattern/book will be on the market in the spring of 2013. The book, “Classy Custom Couch or Chair Creation”, also includes instructions for a stunning bed quilt (just in case you are not in the market for a quilted couch or chair). 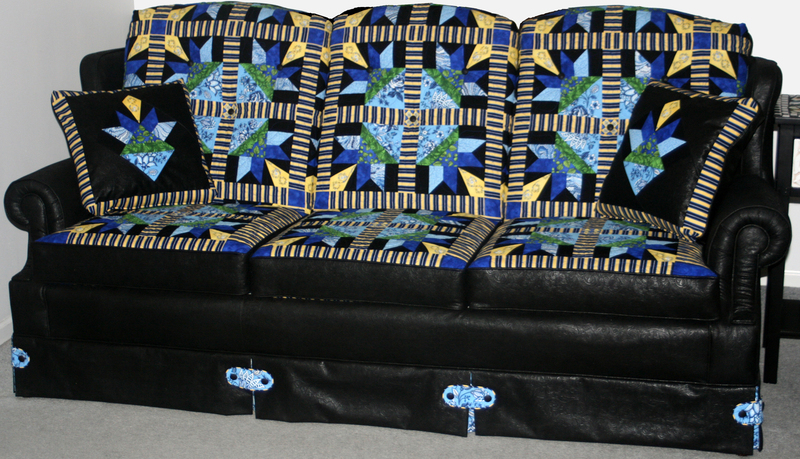 Click here for a slideshow of photos of the quilted couch in progress. 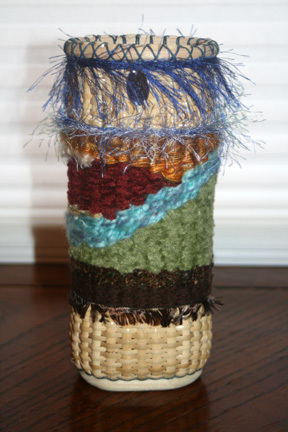 For next week’s blog, I will have just returned from a basket weaving convention. We’ll see what awesome baskets I run across to share with you!